Io Harberts and I made arrangements to get in about 2 hours of paddling before the group arrived at the Rum River landing at 0900 am. Io and Joe Dunaisky are going to do the AuSable together this year, but they live a distance away from one another so they can’t put in long hours together. I’m in the same situation because Bill Briggs lives in Winnipeg. When possible, Io and I will try to get some extra hours of paddling in prior to the rest of the group coming out. Io and I were on the water at 0701 am. 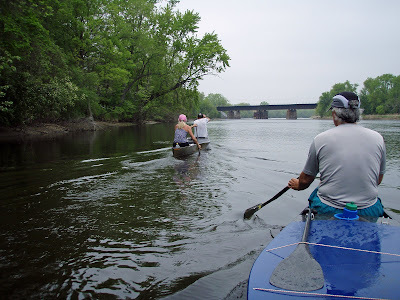 We paddle one hour and five minutes before turning around to head back to the landing. We got back a little sooner than I thought we would, so our total paddle time together was one hour and forty-five minutes. I was going to paddle with Ed Arenz and Io was going to change canoes and paddle with Devin Arenz. Io and I took it easy during our paddle to warm up the muscles and joints from yesterday’s hard paddle. Once we paddle with the group there would be no taking it easy. There were fewer canoes today for the paddle, maybe six or seven canoes. The sprints began at the first bend and the sprints were numerous and often throughout the two hour and fifty minute paddle. Io, Devin, Ed and I wanted to go all the way up to the 7th Ave bridge, but everyone else wanted to turn around about 15 to 20 minutes from the bridge and head back to the landing. We decided to paddle back with them. Once we got to the landing the four of us continued downstream to the dam and then we turned around and headed back to the landing. My total time paddling today was 4 hours and thirty-five minutes. I didn’t get my 6 hours in that I hoped, but it was a hard paddle today. Most of us went out to Caribou Coffee afterwards. When I got home I mowed the lawn since it hadn’t started storming like it was forecasted. When I got done with the lawn I decided to go for a bike ride. I went my normal route which is about 20.7 miles. The sky was getting darker and darker to the west. The severe weather sirens began to sound about a half hour left in my ride. I looked back and saw the dark clouds still coming toward me. The siren stopped after about 10 minutes and then they started back up about 10 minutes from home. I pulled into my driveway and my neighbor next door told me the there were reports of large hail just to our west. There were tornado warnings for our area, also. I was in the house a couple minutes before the rain started. This went over very quickly and it appeared that the worst part of the storm had past to the north. A short time later the rain came down harder and hail came down for several minutes.